Biography: Dr. Coyle earned his Bachelor's degree at Cleveland State University in Cleveland Ohio, USA. Subsequently, he earned his M.D. degree on scholarship at Wright State University, Dayton, Ohio, USA. He then continued with four years of postgraduate medical specialties study at the Wright State University Affiliated Hospitals in Dayton, Ohio, USA. He has over 30 years experience in the medical field and medical academia, primarily as a clinician and clinical scholar. He has practiced in solo, multi specialty group, and academic settings. Most recently, he retired from the Brody School of Medicine (BSOM) in Greenville, North Carolina, USA as a Clinical Professor in Internal Medicine and Pediatrics. During his work at BSOM, he was appointed by the Dean of the School of Medicine to establish a freestanding multi-specialty clinic under the auspices of the school of medicine. This has remained a very important practice for the school and the residents of the city. He is presently working part-time in the field of Addiction Medicine including peri-natal addiction. Talk Description: Many of us are affected, either directly or indirectly, by health issues. We all should expect to have access to clean water and clean air. We also should have the opportunity to gather our own food and clothe our bodies. Unfortunately, human beings are affected by genetic imperfections, disease, trauma, and self-inflicted practices and subject to conditions brought about by industrialization, politics and our changing environment. Fortunately, technology has allowed us to treat, correct, and supplement many of our afflictions and conditions. Recently, there have been significant advances in diverse areas of science and medicine which will be reviewed. Biography: Dr. Maheshwari earned his Ph.D. in computer science from the University of Manchester, U.K. and B.E./M.E. from IIT Roorkee, India. With an overall experience of more than 28 years in the ICT industry and CSE academia, Dr. Piyush Maheshwari brings with himself distinguished and well-recognized thought leadership in the areas of enterprise & solutions architecture, cloud- & SOA-based software systems, system integration, and mobile-enabled applications. He has co-authored 97 papers in various technical journals and international conferences. In his past employment (2006-2015), with Ericsson, IBM Research, and Pitney Bowes, Dr. Maheshwari had extensively contributed to R&D and innovation management and to the end-to-end solution architectures for business applications using mobile services, sensor networks and e-commerce platforms. He had consulted on enterprise architecture assignments for Fortune 500 companies such as Daimler AG, Lufthansa, Vodafone, etc. In his early career (1991-2006), Dr. Piyush served as faculty of Computer Science at the University of New South Wales, Sydney and Griffith University, Brisbane. He had held several research grants from the Australian Research Council (ARC) and well-funded projects in peer-to-peer computing from Microsoft Australia and other private companies. He is a Senior Member of the Institute of Electrical and Electronics Engineers (IEEE) and Computer Society. Talk Description: The concept of a smart city highlights the need to enhance quality, interconnection and performance of various urban services with the use of information and communication technologies (ICT). Smart city technologies promote cloud-based and Internet of things (IoT) based services in which real-world user interfaces use smart phones, sensors and RFIDs. Cloud computing and IoT are presently two most important ICT models that are shaping the next generation of computing. Both concepts have major impact on how we build and deploy smart applications/solutions for smart cities. Cloud computing represents the delivery of hardware and software resources on demand over the Internet-as-a-service. On the other hand, IoT concept envisions a new generation of devices (sensors, both virtual and physical) that are connected to the Internet and provide different services for value-added applications. In this talk, we will address the convergent domain of cloud computing and IoT for any smart city application deployment. Dubai as a smart city will be discussed with some application-based scenarios. Biography: Prof. Dr. E. G. Rajan B.Sc., D.M.I.T., M.E., PhD, FIE is the Founder President of the Pentagram Research Centre (P) Ltd., Hyderabad, India. He is an Electronics Engineer and a Professor of Signal Processing having about 30 years of experience in teaching, research and administration. He has a number of publications to his credit. He is a professional member of ACM and he is an editor of the journal of AMSE, Barcelona, Spain. He received his Ph.D degree in Electrical Engineering, (Signal and Image Processing), from Indian Institute of Technology (IIT), Kanpur, U.P., M.E. degree in Applied Electronics, from Madras University, the then famous DMIT in Electronics Engineering from the Madras Institute of Technology, Chromepet, Madras and B.Sc degree in Physics from Madras University. His contribution to the state-of-the-art of Electronic Warfare has been well recognized in the Government and industrial sectors. He was a noted teacher in the department of Electrical Engineering of the Indian Institute of Technology, Kanpur. He received Distinguished Scientist and Man of the Millennium Award from Who is Who Bibliographical Records, Cambridge, 2000. He authored many books like, Symbolic Computing – Signal and Image Processing, Electronic Order of Battle Records of Military Radars, Computers and Information Technology and Foundations of Information Technology. He is the father of a novel paradigm Symbolic Computing In the Framework of Markov’s Constructive Mathematical Logic. Two of his fifty Ph.D scholars are involved in the design of digital circuits using organic molecules and some of them are working in the novel area of Genomic Signal Processing. He has brought out more than 25 original concepts. One such concept is Codon Space, which advocates the theory of Life Forms as Subspaces of the Information Space called Codon Space. Another concept is a Mathematical Transform, which goes by his name as Rajan Transform. This transform is ideally used for Pattern Recognition and Analysis purposes. He leads the company in his own professorial style and the company is technically strong and steady. Talk Description: The purpose of this keynote lecture is not to teach human values to people (waste of time !). We are here to identify technology for combating security threats. Major threats to the country are classified under two categories: (i) Domestic Threats: Petty thieves, Branded thieves, Criminals, Economic offenders, Antisocial elements, Religious fanatics, Separatists, Corrupted individuals, Traitors and (ii) External Threats: Neighboring countries, Terrorists, Illegal migrants. Indians regained self esteem after independence. Indians outshine everyone in the global level. Indian economy has been more or less steady for a long time. More than three million Indian Americans manage the economy of the USA. Then where is the question of security threat ? Some of the domestic threats like Treason, Sedition and Sabotage cause this concern. Country is getting betrayed by some individuals and groups. Reasons may be many, may be disappointment, political vendetta, religious misconceptions, dogmatic fanaticism, rivalry, and so on. Outcome of treason, sedition and sabotage are (i) Youngsters are seduced to join terror outfits like ISIS and Al Qaida, (ii) Military secrets are being sold for money, materials and worldly pleasures, (iii) Counterfeiting and distribution of fake notes to destabilize nation’s economy, (iv) Provocation for strikes and noncooperation to decrease productivity. The major international threats are mainly from neighboring countries. A country poses threat to its neighboring country by promoting cross border terrorism, infiltration, smuggling of arms and drugs, causing economic instability, spying and occupation, instigation of religious intolerance and separatism, Waging war, Bio war. Reasons may be many, may be local political disturbances, religion based governance, low level economy, political misconceptions, dogmatic fanaticism, rivalry over others’ growth, and so on. Outcome of international threats are (i) Unauthorized supply of lethal weapons and war gadgets to trouble creators and (ii) Border crossing and attacks on military establishments and religious places. This keynote lecture is all about certain defense technologies that might be useful in combating both domestic and international threats. Biography: Dr. P. Sekhar is a respected development thinker and an author of well-documented series of 60 plus books on Secured Techno-Economic National Growth in various sectors such as Highways, Railways, Industry, Tourism, Sports, Agriculture, Education, Power, Healthcare and so on. The path breaking concept of 'Secured Governance” developed by him offers a series of recommendations on various aspects of multi-sectorial growth in India to meet the challenges of the 21st century. None other than Sh. Narendra Modi has applauded him for this unique idea that has attracted interest across borders too, catching the attention of nations like USA, UAE, Tanzania, Kenya, Rwanda, etc. He has spent over four decades in R&D based technologies and related human and national development initiatives. Credited with having laid the foundation of first Software Technology Park in India. He holds a Master's Degree in Science with a doctorate in Solid State Electronics and Nuclear Physics. He has been associated with various Indian Universities and Educational Institutions.He is also assisting various industries to efficiently use latest innovative technologies along with various funding support so as to immensely contribute to the new Smart Cities initiative undertaken by the government. Talk Description: Secured Governance offers a strategy for the government to get all the basic infrastructure development with a negligible investment by the Government. It is a concept of developing Techno Economic Corridors connecting HUBs which will act as growth centre for individual sectors. The very concept of “Secured’’ here implies a secured convergence or knitting with various sectors defining a growth for an economy. Secured Governance presents a developmental model for the TECHNOLOGY HUB whereby they it can take advantage of the extra Floor Space Index (FSI) provided to it in addition to the value and valuation of the infrastructure to yield higher returns. This valuation of infrastructure, which grows many folds, will support infrastructure development, ensuring balanced growth. Research and Development centres could form one of the major new initiatives designed to facilitate investment, foster innovation, protect intellectual property, and create a conducive environment for best-in-class manufacturing infrastructure - a venture on these lines could be started in the proposed Technology HUB. Biography: Dr. Rama Murthy Garimella obtained Ph.D. in Computer Engineering from Purdue University, USA, M.S. in Electrical Engineering from Louisiana State University, USA and B.Tech in Electronics & Communications Engineering from S. V. University, Tirupati, India. He has more than 25 years of academic and research experience in the rea of wireless sensor networks. He has been Visiting faculty at Tampere University of Technology, Finland, Wrocklaw University of Technology, Poland and University of Illinois, Urbana, Purdue University, USA. He has been honored with Rashtriya Gaurav Award in 2009 from IIFS, New Delhi and Bharat Excellence Award from Friendship Forum of India, New Delhi in 2016. He has published more than 228 research papers in reputed international journals and conferences. He is the associate editor of International Journal of Wireless Networks and Broadcasting Technologies (IJWNBT) published by IGI. He has completed several funded projects and filed patents. He has delivered invited talks at Bell Laboratories, USA, Indian Space Research Organization, Sriharikota, India, Wroclaw University of Technology, Poland, and South Korea etc. He is the Member of IEEE Computer Society, Senior Member of ACM and Fellow Member of IETE. Talk Description: Computing Paradigms such as Cluster Computing, Grid Computing naturally ledto design and implementation of CLOUD computing.In the case of cloud computing, the computing services are provided using the data centers and the results are communicate dusing the Internet backbone. It is increasingly realized that there are many applications where the delay involved in getting results using cloud computing approach does not meet the Quality of Service (QoS ) constraints. Thus, researchers proposed the FOG COMPUTING paradigm(also called EDGE Computing) where the Computation/Communication/Control is carried out using the edge resources ( Computational, networking resources. In this talk, I will cover details of FOG computing paradigm and how it is evitable for realization of Internet of Things ( IoT ).Some important challenges in the design and implementation of IoT will be discussed. Also,we propose the PARADIGM of MIST COMPUTING. Biography: Tanmoy Chakrabarty is Vice President & Global Head - Government Industry Solutions Unit ( ISU ) at Tata Consultancy Services Limited (TCS), based in New Delhi, India. He has over 33 years of experience related with Business Development, Sales and Delivery of Integrated IT Solutions and Services to the Government sector and has led many enterprise wide , mission mode and holistic transformational projects in the area of eGovernance in India and other parts of the World. Tanmoy currently manages 165 Clients in the Government Sector for TCS and has a team of over 7500 Associates in TCS in 12 Countries. 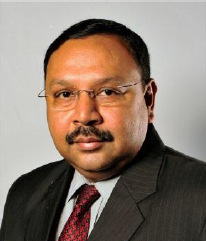 Recent projects include MCA 21 , Income Tax , Central Excise & Customs, Passport and eMigrate and several transformational projects in State Governments and tax automations programs in East Africa.Prior to TCS, Tanmoy was Head - India Sales and Operations at EDS : Electronic Data Systems, India where he served between 1999 and 2004. He was responsible for Sales & Business Development & Delivery in the Indian Market. The sectors that he was focusing on included Corporate, Government, Defense, Railways, Telecom, Energy, Travel & Transportation, Manufacturing and Health Care. EDS was a US $ 22 billion Global IT Services Company with over 140,000 employees in 60 Countries. Widely traveled in India and all over the World he has worked at Kolkata, Bengaluru and New Delhi. His started his career in 1982 – 1996 with Bradma of India Ltd in Calcutta ( Tata Company ) as a Sales Executive and progressed to handling the Eastern Region through to managing All India Sales & Marketing functions, leading various teams of highly motivated team members to successes in the stints. Tanmoy joined Siemens Nixdorf, India in 1996 - 1999 as Vice President - Sales & Marketing at New Delhi and was responsible for All India Sales & Marketing of the various Information Technology Products and Solution and Services. He is a member of the IT Sub-Committee at Assocham, CII, FICCI and PHDCCI. He is on the Defense IT Sub Committee for FICCI. Additionally he is a Member of the IT Task Force of the Chief of Air Staff, Indian Air Force and a Member of the IT Think Tank for the Chief of Army Staff, Indian Army. He is a member of the Executive Committee of Electronics and Computer Software Export Promotion Council for 2015-17. He is a Member of the FICCI Inclusive Governance Council Committee and the NASSCOM Domestic IT Council. He is also on the Board of Management of the Indira Gandhi Delhi Technical University for Women. He is a member of the Digital India Committee at CII and member of CII National Committee on Telecom and Broadband for the year 2015-16.He did his schooling from La Martiniere for Boys, Calcutta and holds a Bachelor's Degree in Commerce from St. Xavier's College, Calcutta and is an MBA from IMM, Calcutta. He has completed an Executive Development Program from The Babson College, Boston, Massachusetts, USA. Talk Description: Government today are highly inadequate to make the expectation of services of Citizens. A holistic transformational approach duly enabled by Information Technology is the only way to address this challenge.The talk will highlight the features and trends of how IT can transform Governance and provide example of how this has been done with several Governments.